Gluten Free Training: Be careful when purchasing gluten free candy! Be careful when purchasing gluten free candy! The below information I got from the Be Free For Me Blog. Shelly Case always has some great advise. The link is below if you would like to read more. Question: Do you have any suggestions on celebrating a safe gluten-free Halloween? How about a gluten-free candy list? Answer: It’s that time of year again – Time for witches, ghosts, goblins and other scary stuff. And for those that are on a gluten-free diet, many favorite Halloween candies can be added to the list of frightening thing. That is why it is so important that due-diligence and extra caution is given when it comes to deciphering what Halloween candy is a “treat” vs. a “trick”. Following are a few tips and pointers to make you and your family’s Halloween a goblin’ good time! - Hidden Gluten Is Scary! When people think of foods that could possibly contain gluten, candy is normally not on the list. That is why so many people are surprised to learn that many candies, such as licorice and caramels, can be packed with wheat. My rule of thumb? Never assume that candy doesn’t contain gluten. Treat all candy like “normal food” and read every single label before eating! - Fun-Sized Candies May Not Be Fun! Many food manufacturers use different formulations for different sizes of the same candy. So that jumbo sized candy bar you eat during the year may contain gluten in the fun-sized portion. Again, read every single label before eating! - Watch Out Smartie-(Pants)! Depending on what country you live in different candies can be called the same thing. One may contain gluten and the other may not. An example of this is Smarties. In the USA, Smarties are tiny, tart pastel colored candies that are free of gluten, while Smarties in Canada are small candy coated chocolates – that contain gluten. This is why it is so important that when you review a gluten-free candy list you are sure that the list is specific to the country where you live. 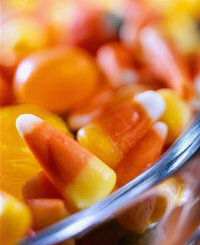 I love the gluten-free Halloween Candy List that is published, each year, by MyGlutenFacts.com. They have two lists – one candy list for Canada and the other candy list for the USA. - Don’t Eat Candy With No Label: Many people like to put candy corn and other small Halloween candies in little, cute bags for party favors or to hand out to Trick or Treaters. This means that there is no ingredient label on the candy. If this happens follow this mantra: No label = Not Able.